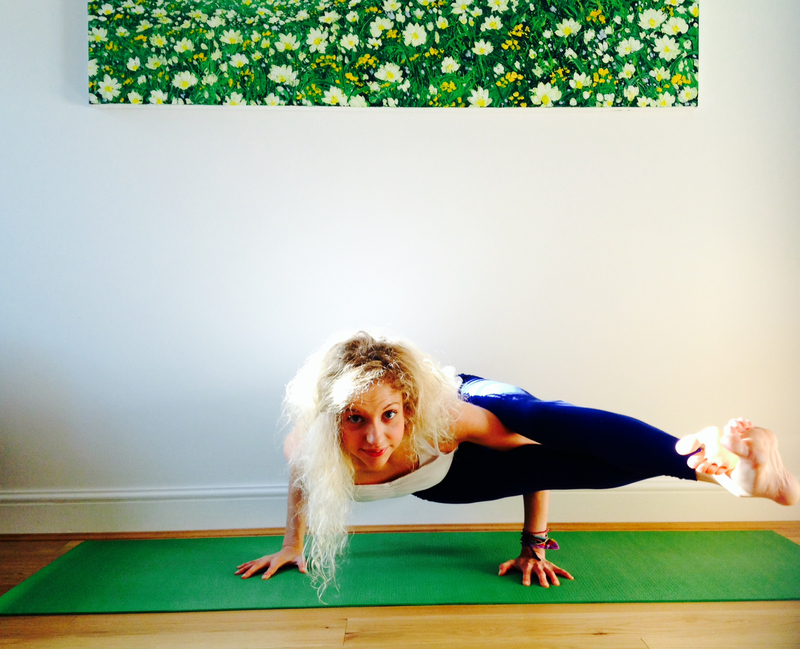 Possibly in some people’s ‘crazy arm balance’ category, Astavakrasana takes patience and practice. It’s often something which people decide they ‘can’t do’ before they even try….. While it may look a little complicated, Astavakrasana is easier than it may first seem if you approach it in the right way. The first step towards this pose? Something the Bhagavad Gita taught us; to let go of the fruits of our actions. That is, to work for the love of it, putting in our best efforts and knowing we did our best without getting attached to the outcome. To be honest, that is probably the most difficult part of any pose – sometimes you feel you’ve got it all nailed, other times you’ll feel like a wobbly mess…. Just go with it, it’s all a learning process…. Astavakrasana requires patience, a strong core, upper body strength, and flexibility in the hips – which is what we usually acquire after a lot of practice. Good steps to work up to this pose include core strengtheners like Navasana and Trikonasana – which involves training our core to become both strong AND supple, so it’s actually functional instead of rigid and frozen like the superficial 6-packs tend to be – try plank pose, and side planks too. You’ll also need arm and shoulder strength, which can be worked on with chatturangas, dolphin pose, planks and side planks. Great hip openers to work with include standing poses like lunges and prasarita padottanasana to open the outer hips, and lizard pose and baddha konasana to open tight adductors. Finally, get used to lifting yourself up with Utpluthihi, Bakasana, Parsva Bakasana, and especially Eka Pada Bhujasana. Keep practicing – without rushing yourself toward completing this pose, and enjoy the strength and flexibility you build along the way! From a seated position, take your [right] leg and hook it over the [right] upper arm as far as you can, somewhere between the elbow and shoulder – of you can hook it over the shoulder then go for it. Make sure both hands are firmly on he ground beside you, fingertips facing forwards, creating hasta bandha** – Hasta bandha is the ‘hand lock’, similar to what your hands are doing in downward facing dog – pressing firmly in to the fingertips and knuckles, especially the knuckle of the index finger. This helps to strengthen wrists and hands so you’re able to hold yourself without any aching wrists. With hasta bandha, actively claw the hands in to the floor even more, imagining the centre of the palm of the hand like a suction cup, pulling the energy upwards. Lift the body up and bring the ankles to cross. The final part here is to extend the legs, sliding them out along the upper arm so they’re hugging around the arm above the elbow joint, towards the biceps. To come out – draw the legs in by bending the knes and hugging the ankles in, and place your bum on the floor. Extend the legs out in to dandasana (staff pose) and try the other side – noticing the differences in strength and flexibility on each side of the body. I love everything about the way you wrote this post. It instills confidence. I have to go try this now. Keep on worƙing, great job! to more introduced agreeable from you! However, how can we be in contact?